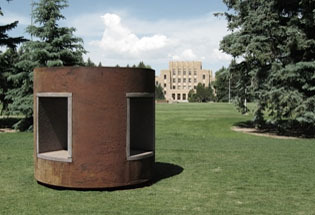 Sculpture: A Wyoming Invitational originated in 2008 as a temporary outdoor exhibition in response to the University of Wyoming Art Museum’s extended closure for renovations and to the increasing interest on campus and in our community for public art. Originally, seventeen sculptures by sixteen artists were on view. By special invitation, the artists of Ark Regional Services created an outdoor work for the Creative Arts Center. Artists of Ark, A Tribute to Alexander Calder; 1174 N. Fourth St.
Talal Cockar, Tierra y Libertad, 119 S. First St.
Travis Rhett Ivey, Hollyhock Haven, Custer St. between First and Second Streets. 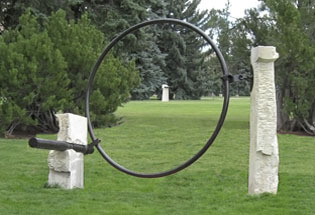 Sculpture: A Wyoming Invitational has been curated by Susan Moldenhauer, director and chief curator of the University of Wyoming Art Museum and organized by the University of Wyoming Art Museum in partnership with the University of Wyoming, various agencies in the City of Laramie, and the Albany County Public Library. The Laramie Mural Project is a partnership between Laramie Main Street Alliance and the University of Wyoming Art Museum. Made possible through the generosity of anonymous sponsors and the National Advisory Board of the UW Art Museum, with additional funding from the UW President's Office, UW Academic Affairs Office, UW Physical Plant, Wyoming Cultural Trust Fund, Guthrie Family Foundation, FMC Corporation, Richard & Judith Agee, John & Mari Ann Martin, American National Bank, First Interstate Bank of Laramie and First Interstate Bancsystem Foundation, Elizabeth Firestone Graham Foundation, Haselden Construction, Murdock Law Firm P.C., Rocky Mountain Power Foundation, Albany County Tourism Board, Laramie Parks & Recreation, Laramie Economic Development Corporation and the Laramie Beautification Committee, Wyoming Public Radio, Albany County Library Foundation, Wyoming Cultural Trust Fund, and the Wyoming Arts Council through the Wyoming State Legislature and the National Endowment for the Arts which believes a great nation deserves great art.